How do you choose fabrics for a quilt? Do you start with a quilt pattern in mind? Do you stick to one fabric line? I consider this a subject that I do not know the answer to, I am very much still learning how to do this! I'm not just wondering about colours, I know there are some wonderful web pages like Design Seeds and Kuler which can provide you with hours of fun finding lovely colour schemes. Oh yes. I've spent hours and hours on them! 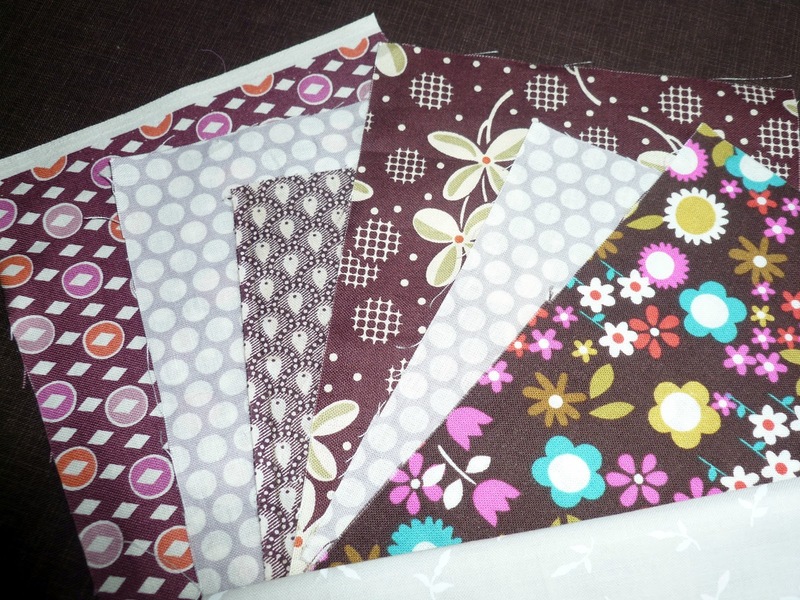 I wanted to do Lynnes Dead Simple quilt, but I just couldn't pick one favourite colour scheme. I ended up taking a whole moda charm pack and starting the as yet unfinished Dead Undecided quilt.... Anyway. I'm talking about solids or prints, or both. Flowers or shapes. Or both. How do you select your fabrics? To begin with, I thought the only way I'd be able to get it right would be to just buy collection bundles, or precuts. I started to feel that I shouldn't just be doing that, that I was "cheating" doing that, maybe that was a teeny bit, well, boring. So, I started to try and mix it up a bit. Not having access to a large fabric shop and doing 99% of my shopping on line, that really wasn't easy. The biggest problem I think, is that there are one or two prints here that I don't actually like all that much. Oh I feel terrible saying that. I got so obsessed with the black and blue plan that yes, I did include a couple of fabrics that I don't really like all that much purely because they met the "black and blue" plan so well. So, its more important that you love them than whether you think they're a perfect fit. When thinking up my stained quilt, I had better luck - although possibly because I started with prints from a designer line... I started with 5 prints from Silent Cinema by Jenean Morrison, the pink colourway. Colour wise, they were mostly grey, but two had bits of pink in them. I like that.... So I started hunting down greys, even found one with some pink in it. That's really all I was thinking at the time. That, and the fact that there was one print in particular that was special. A large scale but very detailed pattern, with no "right way up", and OMG I love it. So, I wanted that print to be the star of the show, and when picking other fabrics I kept in mind that I wanted them as a supporting cast! Mum and I came up with this pick for a quilt we worked on whilst she was here. I think its a pretty successful mix. 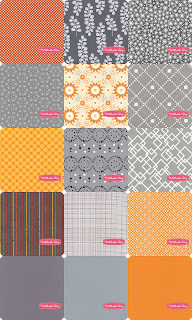 This time, not only is it a colour theme (ash grey solid background, green prints, one yellow green, and one bright orange) but when you look at the patterns there are other similarities too. There is a very geometric thing going on. Its all dots, squares and crosses... Also love that the green on the far left has a teeny bit of orange in it. The pattern scale all seems to be about the same size too - I'm not sure that's entirely a good thing. I'm happy with the quilt we made, but in a different quilt pattern I think this bundle may just be lacking a different scale print. At the same time, mum came up with this pick from my scraps. 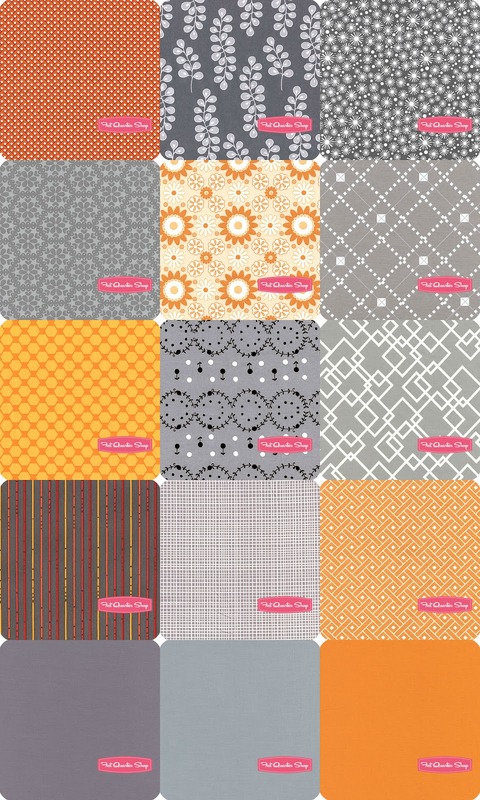 This struck me as a great way for auditioning prints for your own bundle, and I think I've found a new and slightly cheaper alternative to bundle buying addiction... Kate from M is for Make does a wonderful fat 16th bundle for a lot of the lovely fabric lines in her shop. I'm not being paid to push it, I just think its a brilliant way to find out whether a bundle is right for what you want, £4-6 for a fat 16th of each bit. And the 16ths will give you a fabulous scrap stash for cushions, charity blocks, zippy pouches, or whatever wee things you make in between quilts! Some people just have a knack for it. But the more you do it the better you will get. Love what you choose - if you don't love what you pick, you wont get quite so excited about working with the pick, you wont feel quite so motivated to keep working with it, and you wont feel quite as satisfied with what you make. Be brave and mix things up a bit. Designer collections will work and look fab, but mixing things up make it more personal, and a little bit different! Having a "star" print and building around it with complimentary, more subtle prints works. Having one colour theme and throwing in one or two bright, complimentary colours works. But that doesn't feel much in the way of instruction ... help me out here, how do you select your fabrics? I think you are far better at this than you are letting on. I have to push myself to go outside of a single fabric line as I would much rather stay there and rely on the designer to make things go together. Then I tend to make one kind of rule and go with that. I take out the things that don't fit or start over a fair bit. Sometimes it works. I do everything this way ... when I write it's often from years of scraps and single sentences that I've jotted down because I like the way they sound, and eventually they stick together in an order that kind of flows and makes some sort of sense (or nonsense!) ... same with cooking, I invent concoctions from the ingredients I have that kind of go together, and usually the result turns out quite tasty! OK, I'll never be a master designer or writer or chef, but I like what I come up with most off the time, and life's too short to be too perfectionist! Sorry, I know that doesn't really answer your question, but I think it's fun to have a substantial stash pile and select from that and keep adding back to it! ... it's like having a huge toybox and getting out the things you want to play with! ... and I also think it's fun having a large stash because in stash form those pieces can potentially be anything at all, from a quilt to a tablecloth to a dress to a mug rug... you can keep imagining them in all their different possibilities until you imagine them with a couple of others that really gel and an idea begins to take shape! I think there is NOTHING wrong with using just one designer's line of fabrics for a project. I know, there are some bloggers out there who think this is boring or too matchy matchy. And I am deeply impressed by their kills. But a quilting project takes so much time and money, I think it is better to start with sth. you know you will be happy with than to find out you don't like your selection once everything is coming together. And then there are some bloggers who I just plainly admire and honestly, I don't think I might never quite be able to grasp how they are doing what they are doing (karyn at make something.ca comes to mind or saidos da concha...) because it is just so fabulous. So in a nutshell... Don't worry, keep practising, allow yourself to screw up once in a while and have fun with your"mistakes". I really don't think you need very much help Sarah! I do buy designer collections, because as you say, you know they are going to match,. I have to buy on-line too, so this is important. Also, when you only have a small stash, it's unlikely I'm going to have anything that matches, colour or pattern wise. I think the answer is to KEEP ON BUYING and build up that stash, then hopefully I can come up with my own combinations! I don't think you need much help either, and I'm probably not going to be much help. Each project I tackle differently. Sometimes I start with a pattern and pick fabrics that I think will work with it, colour, print size. Other times I choose different fabrics then think of a pattern that will work. I sometimes like to pick a multi coloured focus fabric and then finding fabrics that work with it. I love combining fabrics from different lines, but I don't see anything wrong in using just one fabric line. My preferred way though is starting with a pattern idea and then finding fabrics that will work. I do usually stick with similar styles of fabric, like modern bright and bold prints, or retro 50s florals, stripes, spots, or 30s repros. I don't generally mix them in the same quilt. Im like Leanne too, I quite often change my selection as I go, especially if it's not working. Buying online does make it difficult to know whether it's going to match or not. Stash building unfortunately, lol, is the answer. However, with my favouritest quilt I've made so far, I chose the 1st fabric which I loved & then built the rest of the quilt around it - just like you did with Stained - & this remains my favouritest quilt. I am lucky tho as I have two quilt shops within easy driving distance & The Eternal Maker a small trek away - don't think I'd have the confidence to pick online - altho Hawthorne Threads have a helpful 'co-ordinating prints' widget so I guess there are other sites with the samesuch. I have a lot of stash so I am used to putting fabrics together but it is not always successful. Like everything else it is practice, practice, practice. I also tend to work as I go along - I do not know usually what the final quilt will look like from the beginning...it is sort of surprising if/when it works! i have only once bought a bundle of fabric all in the same line. I am really lucky with the number of fabric shops around me, so mostly I tend to pick up fat quarters here and there that I like and eventually make them in to something! Um, what I tend to do is start with one fabric, often a print with different colours in it and pick out the colours, either in plain or prints with a similar size. I've only just realised that's how I do it. Like you though, my shopping is done online so it's a harder to get it right. I've built up quite a stash, so now have a wider choice of fabrics to choose from because for whatever reason the fabric online, wasn't what I thought would go with what I have or what else I bought with it. I have only once made a quilt from one designer, the one I just finished for my husband. I think the prints are too busy together, so broke it up with lots of solids. Was that as clear as mud? I don't know I just throw things together that I love and it almost always works. I really don't think there is method to my madness. Working around a star print has never worked for me because I tend to choose all fabrics that I love and I can not play favourites. Same goes for a pre - determined colour scheme, it never works out that way for me. I tend to be drawn to certain colours and prints though, that might be the secret. Having a clear taste in fabrics, knowing what you love. If you would throw my entire stash together in a quilt I am convinced it would all look great together! I think I start with one fabric, usually a print, and then choose other fabrics that match different parts of the print. My stash is an almighty mess and sometimes I just notice that 2 fabrics that are randomly sitting next to each other look great together, and I go from there. I try to have a range of scales in the prints I choose, and I think sometimes throwing a few solids in can tie it all together. I love the fat 16th bundles from M is for Make! They are perfect for making the sprocket pillows that I can't stop making! I'm loving reading what everyone's got to say on this topic, thanks Sarah! I shop mostly online and have often chosen fabrics with an idea in mind but have ended up with a stash where nothing much seems to look good with anything else! I can't afford to keep practising so I guess I just need to get on and use the stuff anyway, lol. Being so early on in my quilting career (not sure one can call it that with only one quilt and one wall hanging completed mind you) I have tended to stick with designer lines when buying with future quilts in mind. Saying that though, although the quilt I made was all from a Sandy Gervais layer cake, the wall hanging was just a collection that I made up from some fabrics in my stash (including a few leftovers from the quilt) and some FQs I grabbed in Mandors that fit the general autumnal colour scheme. I had in mind a rough sketch of what I wanted to make, with the falling leaves, and then went through a range from yellow through orange, red and reddish purple to brown. It's easier to do that in person though, where you can hold things up together, doing it online is a whole 'nother challenge! I select fabric a variety of ways: Either using the whole line approach - although I often find their are a couple of fabrics in a line that appear to just be making up the numbers and I don't think go so well. Using a whole line is a relatively new approach for me. I enjoy picking my own bundles. I only shop online for fabric these days but have rarely found this a problem as I've gone for the building a stash of what I like and then I either think of an appropriate theme or pull a couple of fabrics then see what else I have in my stash that plays well with them. 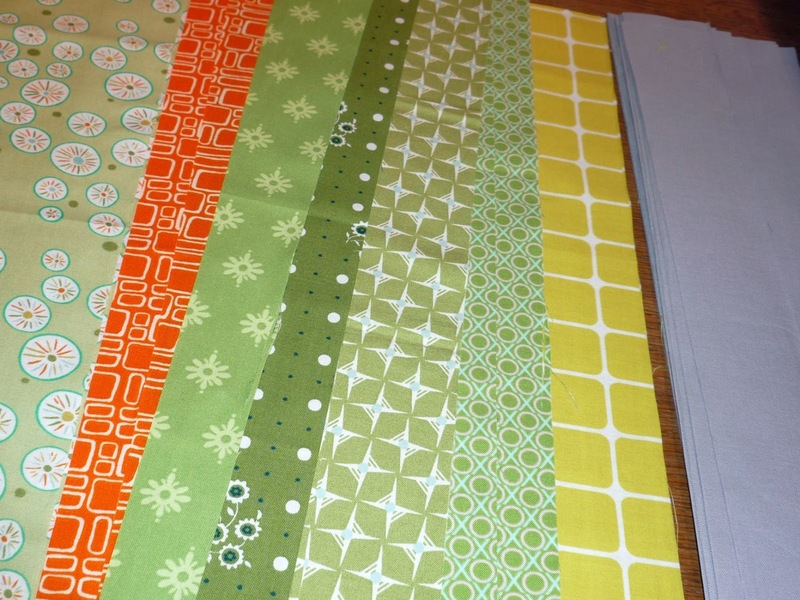 When I made my spring greens quilt it came about because I had quite a few fat quarters of green fabrics. I just bought a few extras so I had enough. I quite like the scrappy look so sometimes I'll play with scraps and make them work. I don't think there is a hard and fast rule, you just have to go with what feels right. If something doesn't look right, take it out and find something else that might work better. I also think you're much better at this than you think. I used to buy all of my fabric in person so could spend time selecting fabrics and seeing what worked - I used to stack the bolts/FQs on the cutting desk, walk away and then turn round to 'take them by surprise' - that way I could see if there were any that didn't work (odd, but true!). I don't buy bundles or whole lines (no money!) and on the rare occasion I buy a charm pack I like to add in extra fabrics (hopefully from my stash although as that is made up of leftovers from other projects it doesn't always have the colours, etc. I need), often to bring out one colour. I like to start with a focus fabric and build from there. (Sometimes the focus fabric doesn't make the cut but I find I need a starting point.) When buying in person the legend bit on the selvedge (the coloured spots) really helps but that's not much use when buying on-line, which I find really, really hard. I also find it much easier to start with the quilt design and then pick the fabrics - doing it the other way leaves me racked with indecision! Hope all of that makes sense. And you're right - pick what you love, not what will do in the absence of anything better...that way you won't end up with fabric that you just don't like! Great post - thank you! I approach fabric buying by price! If it is on sale, I might buy it. Of course I have to like the colors in general too. I only buy quilt shop quality fabrics. (yes I am a snob that way) I shop the clearance racks at the stores and online. I love a bargain. When faced with a quilt project, I then shop my stash. I must be picking out good stuff in the clearance bins because I can always come up with something from my stash that works well in most projects. Having said that, there have been a few exceptions. I did buy (on sale of course) a couple Bali Pops for a particular project. Half of this quilt will be from those Bali Pops and half from a fabric I already had in my stash. 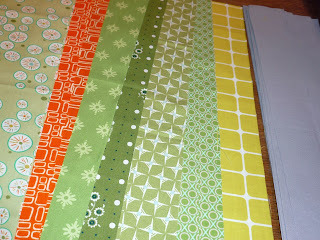 I also bought a pre-cut jelly roll of Moda Solids in bright colors, for a Cathedral Windows quilt I am working on. I don't think you are doing anything wrong in how you say to choose fabrics either. Really, to each his or her own! If YOU like it, then THAT is what really matters. Of course getting heartfelt sincere compliments when the quilt is completed makes one feel like they did extra good in choosing their fabrics too! Lastly, I think we often KNOW if we've hit the right combinations of fabrics when we can look back on the finished quilt and say to ourselves, "Dang, that is one pretty quilt! I did good!" Just don't tell anyone I said that! I don't have a clue how to make my own bundles. It helps that many of my quilts are scrappy so I just hold fabrics up together until I have a pairing I like. My ATSQAL quilt I chose one fabric I loved and then based all the other fabrics on the colours within that print. Basically I am a bit hit and miss. Hi Sarah! 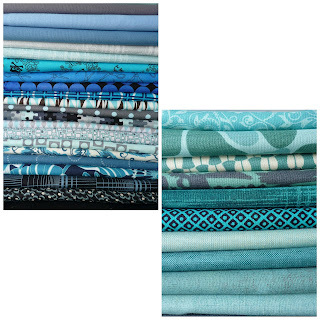 I think I do different things (in terms of selecting fabrics) for different projects. After "stalking" my Mouthy Swap partner, I found what color scheme she likes and then looked for it in my stash. I have a pretty good stash right now (after the holidays), so it worked out that I didn't have to go out and buy. One thing that has been very helpful to me is that I purchased a solids jelly roll (in darker colors, but covers all the color families) and that has been helpful on so many projects to accent the prints. I would definitely consider getting another solids bundle of some sort since it has been so handy. (they also have brights and pastels)-- and I still have some left to use, after a number of projects. I'm definitely not a "natural" when it comes to fabric selection, but I do okay when I need to and sometimes I ask for advice. I know what you mean about buying on-line- sometimes the colors are off on-screen. I should read all of the previous comments to see what people have said. Well I love designer bundles, because I can't afford to risk getting stuff that doesn't go together, and I am a sucker for pre-cuts and Moda - mainly as you know the Moda colours are the same across lines, so when I mixed up the Central Park and Just Wing It, they worked together. I definitely think if I lived in the US with all that cheap fabric on tap I would be more adventurous! I tend not to buy a whole line, just because I don't always like all the prints ... I try to have a selection of tonal value (dark, medium, light) in any colourway ... doesn't always happen. Or ... I have a pattern (by which I mean block or improv vibe) going on and then I find fabric to match. Actually, I think I'm a bit more random than that. My real advice is to photograph little bundles that you pull. Then take the colour out and see how they look in b/w. Good question. I think I'm most comfortable either picking a star fabric and pulling other colors from it or sticking with different shades of the same color (sometimes I'll add a neutral or contrasting fabric to the bunch.) Ditto, the reference to Jeni's color series at In Color Order. Also, since I'm trying to limit the amount of money I'm spending, I try to buy for particular projects and when that fails, I buy just my favorite prints from a line and/or a charm pack. The downside is probably that once I decide what I want to do with one of my little bundles it will be hard to find more of the same... I guess I need to sew faster! It's great to see the thought process behind different people's methods. I love picking fabrics, and seldom use a line together. Sometimes I choose a color palette as inspiration, sometimes I use a single piece of fabric as the color picker (whether the inspiration fabric is included in the final project or not). I have EQ7, so I can play with color easily before choosing actual fabric. I have a monster stash, and for the past couple of years have been trying to work from that as much as possible. I actually try to remind myself of the opposite of one of the things you've learned - that I DON'T have to love every piece of fabric in the project. Sometimes the overall effect in the quilt is more important. 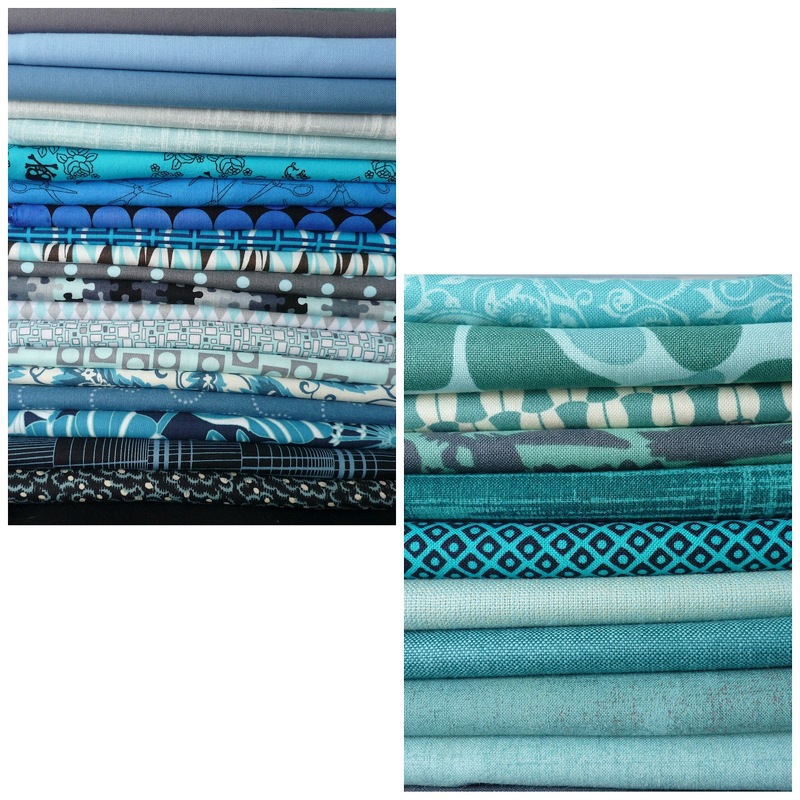 The one thing I'd add to any fabric selection decision is an awareness of value (light/dark). For me, I really need to see a range of values in a quilt for it to speak to me. I think for me, it really depends on the project. Like, for my Swoon quilt, I pulled from stash and made a big pile of tan, aqua and brown fabrics. Then I let them sit, added and subtracted and paired and re-paired until I was satisfied. But that one, I started with the pattern. As mentioned above, I don't have to LOVE every fabric in a quilt, or even every block. Sometimes it's the little odd ones that make the best of them shine that much more brightly, if that makes any sense? Ah, you got me thinking. (And for some reason it's at least the fourth time I'm trying to post a comment on this - each time before I got distracted and didn't click the "publish" button). I think I don't have a unified approach. Sometimes I use the whole line (although this means using a charm pack or a layer cake, unless we can count the Kona Poseidon, which is 21 FQs bundle). Sometimes I use just some prints from one line. And sometimes I choose all the fabrics myself. In the last case I usually start with a colour combination (either my own, or something the future quilt owner chooses) and try to find fabrics that would go together. I try not to mix fabrics that are too different in style, but I like quite eclectic combinations. I only shop online (well apart from some Ikea fabric for backing or sometimes also sashing) so I usually start with one shop, put all possible candidates in the basket and then see how they go together and what to eliminate to arrive at the best combination. If I can't find enough fabrics for the project in one shop I usually try in a different one to avoid too high shipping costs. Sometimes I also save the fabric images and try to arrange them in a graphics program or EQ7 to better check how they might look in a particular design. And there have also been a couple of cases (e.g. my current favourite – the wavy quilt ;)) in which I had a design idea first and the choice of fabrics followed more or less naturally from the design.